Google around a bit and you'll find a few slide rule simulators out there. 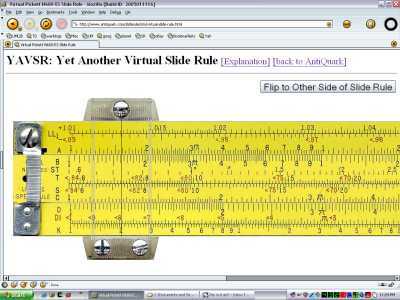 There's Slide (EXE for Windows), JavaSlide (in Java) and The Slide Rule (also in Java). The hardest part was scanning the ruler, making sure it was perfectly horizontal, then tweaking, undistorting, redistorting and generally hacking the images to make them fit together and not look like crap. Even then, there's still some distortion and some of the scales are misaligned slightly. INSTRUCTIONS: Just click and drag anywhere on the rule to move the different pieces. To switch to the opposite side of the rule, click the Flip to Other Side button. COMPATIBILITY: Works with current versions of Mozilla, IE and Firefox. "dd.obj.maximizeZ()" so that the images would maintain their original Z-order when clicked. That's a very nice simulation. I used the N600-ES in college ca. 1971-1974. I bought it new from a friend for $5. It's nice to see such a faithful reproduction.